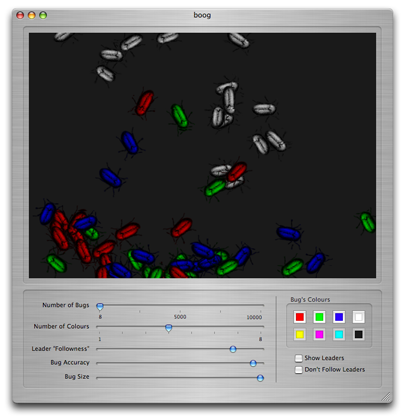 Boog is a small toy where you can play with some parameters to control a bunch of bug's behavior. While working on another project, I realized a subset of it could be nice to play with on its own, so that's how boog came to life. Launch it, and play with the parameters! Click on the view to go Full Screen. Yes! If you really want to, you can always contribute to my Pay-Pal account. If you want to include it into any CD-ROM or other media to mass-distribute it, please email-me! Slow computers might need to pull down the number of bugs to keep the simulation running smooth.